In addition to resistance training, diet plays an important role in strengthening the muscles for a healthy body. A muscle-strengthening healthy diet should be composed of protein, complex carbohydrates and healthy fats. Protein is essential for the growth, maintenance and repair of body tissues and muscle. Complex carbs, including fruits, vegetables and whole grains, provide energy to the body as well as essential vitamins and minerals necessary for muscle recovery. Healthy fats are essential for normal body processes and hormonal balance and assist in fat loss. The addition of specific foods that contain these nutrients to your diet plan may increase muscle strength for a healthy body. 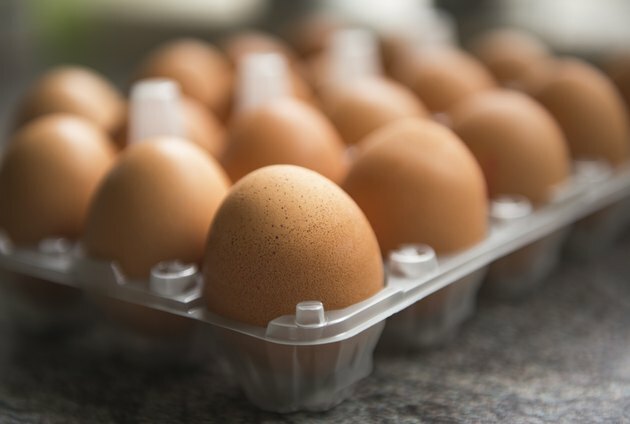 Eggs are a healthy addition to a muscle-strengthening diet. This super-food is a complete source of protein necessary for building and repairing muscle tissues. It is also low in calories, contains heart-healthy fats and is a source of the mineral iron, which transports oxygen to the blood for use by the muscles. Iron helps to prevent fatigue, decreased energy and sore muscles after a workout. An egg's fat and iron content is mostly found in the yellow yolk, so eat the whole egg. Although it is a source of cholesterol, dietary cholesterol generally doesn't bind to the cholesterol in the blood. Hence, eating one to two eggs per day is a healthy addition to your daily diet. One egg has only 75 calories, 6 g of protein, 5 g of fat and 0 g of sugar. Leafy green vegetables are a healthy addition to a muscle-strengthening diet plan. Greens such as spinach, arugula, kale, Swiss chard and butter lettuce are a rich source of vitamins and minerals that aid in the recovery and repair of muscles. Proper rest and nutrition are essential to repairing muscle fibers after hard workouts that cause tears in muscle fibers. Leafy greens are also a source of energy, needed to fuel muscles to perform work and to restore depleted glycogen stores after a workout. Add spinach to a large salad or with dinner for a rich source of calcium, magnesium, iron and vitamins A, D, E and K.
Lean meat is well-known as a muscle-building food since it is a high source of protein. Meat is a complete source of protein meaning that it contains the essential amino acids necessary to build protein. Protein is essential to developing muscle growth and for faster recovery post-workout. During the recovery period, muscle fibers are repaired and come back stronger, which is how muscle growth and strength gains are developed. Include lean turkey, chicken breasts and lean beef labeled as tenderloin or top round with your meals to avoid excess saturated fats found in certain cuts of meat. A 3-oz. skinless, roasted turkey breast provides 115 calories, 0.6 g of fat, only 0.2 g of saturated fat and 26 g of protein. Complex carbohydrates, such as whole-grain foods, provide energy to the body that is essential for muscle growth and repair. Oatmeal is a healthy carb that is high in dietary fiber to help keep blood sugar levels steady and appetite under control. Muscles need fuel to perform actions necessary for functional purposes and working out. Sufficient carb intake is also essential to spare protein to be used for its own purposes instead of fuel. Eat oatmeal for breakfast for, before or after a workout combined with berries and low-fat milk for a healthy meal.